This is part 2 of the “Housing in MMOs” series. Part 1 was looking at Lord of the Rings Online. Today’s MMO is Aion. This blog post was largely written by thevalliant and edited by me in some parts. While I did play around with my free studio in Aion, I really don’t know that much more about housing in the game, so I asked somebody who does. When reading this article, please keep in mind that we both play on the European servers which are handled by Gameforge while the US servers are still handled by NCsoft. There may be differences in details like item shops, etc. between those two versions. Each character gets their own studio once they hit level 21. Differences between them are many and varied. Obviously and primarily they differ in appearance: a studio is like an apartment in a block of residences, quite indistinguishable from one another, while a mansion or an estate really stand out and come with a (small) selection of looks for you to pick from. Secondly, they differ on the number of objects you can install on them. More on that in the section “Is there an item limit?”. Another big difference is the buff your character receives depending on the type of ‘house’ he owns (more on that in the paragraph about advantages you get when owning a house). When it comes to appearances, there are nice – thus expensive! – neighborhoods and others that are, let’s say, less popular ones. Popularity, hence starting bid at auctions, depends on the area’s surroundings (town or swamp, for example) and also how easily accessible the house is (if there’s a teleporter nearby for example or if you have to walk to it through hostile/contested grounds). I already mentioned about interior and exterior items’ limits being different for each type. 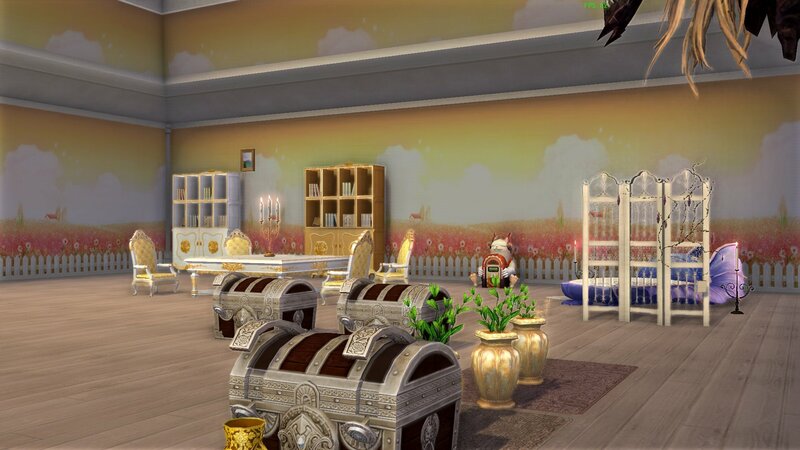 Studios allow for 20 interior and 0 exterior items, ranging up to 70 interior and 20 exterior items for a palace! An additional note: Free players who did not have the game before it went f2p only get “1/3 functional items” in the studio. Let’s take the example of a house, as the most popular and also cheaper alternative to the poor studio. You may install 7 exterior items, 30 interior ones and 4 ‘blooms’ (more on these later). All items may be freely placed in their respective ‘domain’ (inside or outside) and there are no restrictions (i.e. hooks) except those one may expect. For example, you may not place a picture frame on the floor or a carpet on top of a table! Rotation is available along the Z-axis only, i.e. counter-/clockwise. You cannot tip an item. There’s a House Butler, a warm and cute little shugo who doesn’t ask for a salary and who may be ‘programmed’ to welcome friends or shoo away visitors! Adorning your house isn’t really expensive, especially if you craft the furniture yourself. Plus the 400k weekly maintenance fee is not worth mentioning as a common (white quality) drop, typically once every hour of playing/killing/farming, can be sold to the general merchant for anywhere between 300k and 650k! Additionally, Aion allows you to write scripts that do certain things. E.g. making a couch bounce, making furniture glow or other fun stuff. Here is a guide that explains how to write scripts. You cannot expand the house, either in area or in storeys (floors) it occupies. You need to sell your house and buy a bigger one. What you can do is add more storage space by installing ‘containers’ (cabinets). You get a skill that teleports you to your house; it practically opens up a portal to your residence which remains open for 5 minutes, allowing you to return to where you were before. Your ‘Energy of Repose’ (this is a counter of how long you’ve been offline. The higher it is, the bigger the XP boost will be when you get back online) regenerates 5% faster if you own a studio, 10% for a house or a mansion, with the mansion additionally removing all death penalties, etc. Additionally, if your friends – or any guest actually – visiting your house decide to water and fertilize your plants you may get valuable items, like crafting materials or even Godstones! Finally, you can hire special NPCs which provide specialized services to you (or your guests; all customizable through rights and permissions) like selling items, etc. Each character can have one house only. Characters on the same account don’t share either their houses or any items therein. Big topic this… If you already had an Aion account before the game switched to f2p, your account is considered a veteran one. If you start to play the game now, you can only have a free account with lots of restrictions or pay a monthly fee to get rid of them. See this overview for more information. There are a lot of items one can use to place in their home and these come from all sorts of sources: quest rewards, ‘chest’ loot (yellow bags), crafting (they introduced a brand new discipline, Construction), trade broker (the auction house), events, etc. A “starter”, i.e. a player who’s not a Veteran and has not purchased a “Gold Pack” (which removes all restrictions for one month) cannot sell stuff at the broker or mail stuff to other players, or trade with them – so I would say that’s a significant restriction. They can buy a ‘Gold Pack’ either with real money (at the NCsoft shop) or from the broker. By the way, it seems that the US version, which is offered by NCsoft, does not give any restrictions to f2p players. So you may consider going checking out their business model and decide which one you prefer. European – and US – players are free to play with either version. One thing worth noting is that once you register an acquired item with your home (you enter ‘Decoration Mode’ and press the ‘+’ button) you can either have it sitting there or place it in your home. Should you place it there though, there is no way to take it back. Say you wanted to stash it away to some imaginary warehouse, to be used later or in another house, etc. You may only destroy it! As mentioned above, there are three zones in the game where you can find houses. Oriel and Pernon each consist of several villages. Walking between those would take quite some time. Each Village has its own little square, typically at the middle of their name tag on the map. Among the NPCs found in each such square, there is one called ‘Village Teleporter’. There’s a fee for teleporting, but at least you can travel much faster that way. Each race on a server has access to 242 houses, 157 mansions, 127 estates and 4 palaces. That means there for each race, there is a total of 530 ‘houses’, excluding studios. This means that once those 4 palaces are owned by players, there is no way for you to get one. Studios are unlimited, so you can always get one of those, at least. 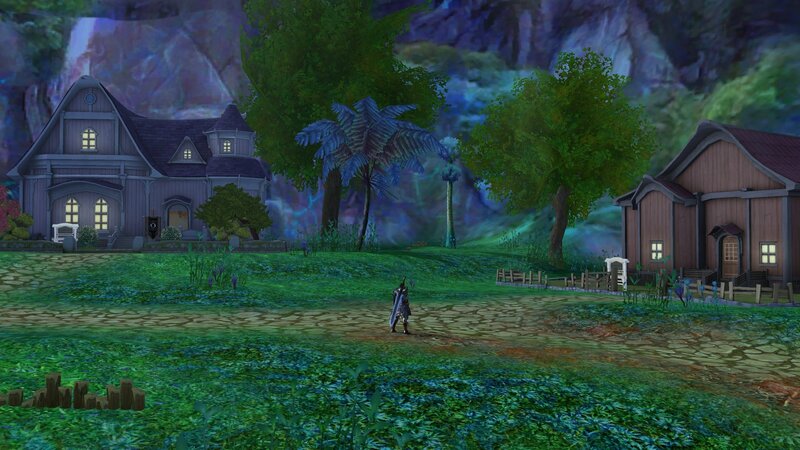 Taking the mic – or pen rather – back from thevalliant, I want to add a few thoughts on housing in Aion. When I first saw the Aion vision trailer, which showed that they wanted to add housing down the road (and obviously did at some point), I was so excited that I went and got the game. Up till then, I had only watched bookahnerk play, but then and there, I wanted to play as well! By now, I have almost completely abandoned Aion and even after looking at the housing, it’s just not enough to draw me back in. It’s pretty, I’ll give you that. It has more freedom than housing in Lord of the Rings Online. But it’s still not enough for me. Unless you buy a palace – and as mentioned above, there is a very limited amount of those per server – you only get one rather small room and a bit of space outside. A house or a mansion – imagine a mansion… look at the pictures below, look at the size of those buildings! And then you get one measly room. No, thank you. And when coupled with Gameforge’s version of “free to play” (even though I do have a veteran account), I’m even less inclined to play this game. The house where your studio is located. 1. Placing a fixed number of residences (House or above) in this area automatically creates a limit on the number of players who can simultaneously, at any given time, own one. What if more than 242 players want to own a House? Did they think this would be very unlikely to happen? Not with the number of players they had online at the time Housing was released. What else then? Perhaps they intentionally created so few of each? We both know what high demand vs low offer leads to. 2. Making the residential zone an open and not instanced area means that its dimensions are fixed. This poses another restriction on the size of houses and their surrounding area: you cannot expand your home outwards, nor can you buy a few more acres for a garden. Additionally, each house is like a ‘cave’ in this open and non-instanced zone, making also the houses impossible to expand. What they should have done is make each residence’s space an instance. Do you remember in Harry Potter the camping tents they had? This approach would at least enable them to create houses with expandable interior, instead of single room ‘caves’. 3. Due to the fact that some big constructions company (Shuggo-owned certainly ^^) created all the houses and then put them up for sale, all houses of the same type look alike. And you can change very few things about them, on their exterior, so few in fact that they still look alike. I believe this lack of customization options is again a technical constraint imposed by their decision to make this zone non-instanced. I don’t know (yet) how WS does it but from what I’ve read each residence is located atop its own floating island (it sounds amazing and it was one of the top things that got me “woao! I want to see this!”). Rift has dimensions. I don’t know how neighborhoods work or look, but from what you’ve told me its not like each house owner is alone on their piece of land and cannot see their neighbors or walk to their houses. So it is doable and they should look at how other games have done it and re-design these two areas. 4. The new crafting discipline right now serves just two purposes: a time sink and a money sink. Crafting in Aion is such a time-consuming process. To give you a clue, people use transformation potions while crafting to eliminate the cheering or despair animation that follows each crafting attempt!!! EACH attempt. So if you wish to create, say, 50 Mithril Ingots and each ingot takes 1 second to craft (it could take more and it could take less as each attempt has their own independent timer…), you will need 50s for the crafting itself plus another 50s for their animation! It’s insane. But being a tree, or a leopard, or a stool (…) apparently means you don’t display success or failure emotions :D . Money sink, well the reasons are obvious: a lot of the game’s materials are used to create the new items and a lot of money are thrown away to purchasing agents and other paraphernalia. Anyway, my point is that they could have taken this new discipline a lot further. Provided they allowed more functionality and expansiveness with their Housing system! If they somehow work out a solution to those issues I described above, allowing for example new rooms to be added inside the houses, they could enable these new crafters to create walls, or attic floors (I love attics!) or so many other cool things. Anyway, I think I’ve written a lot already but I believe you got my point. Aion’s Housing system has great potential and I am sad to see it go wasted, due to either poor design decisions or marketing greed. However -and this is truly a BIG however- their ‘Vision’ trailer shows that they intend to take it further, much further.